b) wäre es möglich, den Code unter einer anderen Lizenz zu stellen? LGPL ist eigentlich nur sinnvoll für shared-Libs, bei template-Headers wirkt es ähnlich restriktiv wie die GPL. BSD-ähnliche Lizenzen sind IMHO im allgemeinen brauchbarer, sogar die alte BSD-Lizenz mit Advertising-Klausel. Siehe auch GCC-STL-Headers, stehen unter BSD-artigen SGI-Lizenz oder LGPL aber mit deutlichen Ausnahmen. Ein paar Worte zu deinen drei Punkten: Ja, die Implementierung macht natürlich eine binäre Suche auf den sortierten Schlüsselwerten in einem Knoten. Jedoch würde ich binäre Bäume nicht als Sicherheitsrisiko, sondern als Performance- oder Skalierungsproblem bezeichnen. Der B-Baum verbraucht verglichen mit dem Binärbaum zwar insgesamt mehr Speicher, aber immer in zusammenhängenden Blöcken. Ob virtuellen oder realen Speicher ist erstmal egal. Durch die größeren Speicherblöcke wird die L1/L2 Cache-Hitrate verbessert, dies zu zeigen war eines der Ausgangspunkte, wie auch in der Zusammenfassung steht. Was an dem direkten Vergleich "unfair" sein soll verstehe ich nicht. Er war Ausgangsüberlegung der Arbeit. Darüber steht aber viel mehr im englischen Text. Binäre Bäume sind ein Sicherheitsrisiko, da die Knoten beliebig im Speicher gestreut sein können. Das kann zu Seitenflattern führen. B-Bäume skalieren dagenen sehr viel besser im virtuellem Address-Raum. Posted on 2007-04-27, last updated 2013-05-05 by Timo Bingmann at Permlink. The STX B+ Tree package is a set of C++ template classes implementing a B+ tree key/data container in main memory. The classes are designed as drop-in replacements of the STL containers set, map, multiset and multimap and follow their interfaces very closely. By packing multiple value pairs into each node of the tree the B+ tree reduces heap fragmentation and utilizes cache-line effects better than the standard red-black binary tree. The tree algorithms are based on the implementation in Cormen, Leiserson and Rivest&apos;s Introduction into Algorithms, Jan Jannink&apos;s paper and other algorithm resources. The classes contain extensive assertion and verification mechanisms to ensure the implementation&apos;s correctness by testing the tree invariants. To illustrate the B+ tree&apos;s structure a wxWidgets demo program is included in the source package. The STX B+ Tree package is now obsolete (2019), because an improved version with better STL semantics is contained the new TLX library of C++ containers and algorithms. The main B+ tree implementation can be found in doxygen stx/btree.h or with plain text comments btree.h. Special interest was put into performing a speed comparison test between the standard red-black tree and the new B+ tree implementation. The speed test results are interesting and show the B+ tree to be significantly faster for trees containing more than 16,000 items on a Pentium 4 and more than 100,000 items on an Intel Core i7 CPU. The B+ tree main header code is covered to 90.3% by test cases. A graphical display of the test suite&apos;s coverage can be viewed online. 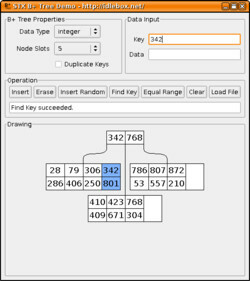 The package includes a demo program, which illustrates how the B+ tree organises integer and string keys. Compiled binaries for Windows and and some Linux distributions are available on the demo download page. See the README file below for a more detailed overview. See ChangeLog below on what changed in version 0.9. Demo Binaries: See Extra Download Page for Win32 and Linux binaries. See bottom of this page for older downloads. All auxiliary programs like the wxWidgets demo, test suite and speed tests are licensed under the GNU General Public License v3 (GPLv3). Some further papers, documentation and some future branches are also available there. The idea originally arose while coding a read-only database, which used a huge map of millions of non-sequential integer keys to 8-byte file offsets. When using the standard STL red-black tree implementation this would yield millions of 20-byte heap allocations and very slow search times due to the tree&apos;s height. So the original intension was to reduce memory fragmentation and improve search times. The B+ tree solves this by packing multiple data pairs into one node with a large number of descendant nodes. In computer science lectures it is often stated that using consecutive bytes in memory would be more cache-efficient, because the CPU&apos;s cache levels always fetch larger blocks from main memory. So it would be best to store the keys of a node in one continuous array. This way the inner scanning loop would be accelerated by benefiting from cache effects and pipelining speed-ups. Thus the cost of scanning for a matching key would be lower than in a red-black tree, even though the number of key comparisons are theoretically larger. This second aspect aroused my academic interest and resulted in the speed test experiments. This implementation contains five main classes within the stx namespace (blandly named Some Template eXtensions). The base class btree implements the B+ tree algorithms using inner and leaf nodes in main memory. Almost all STL-required function calls are implemented (see below for the exceptions). The asymptotic time requirements of the STL standard are theoretically not always fulfilled. However in practice this B+ tree performs better than the STL&apos;s red-black tree at the cost of using more memory. See the speed test results for details. The insertion function splits the nodes on recursion unroll. Erase is largely based on Jannink&apos;s ideas. See http://dbpubs.stanford.edu:8090/pub/1995-19 for his paper on "Implementing Deletion in B+-trees". However it also directly generates many problems in implementing the iterators&apos; operators. These return a (writable) reference or pointer to a value_type, which is a std::pair composition. These data/key pairs however are not stored together and thus a temporary copy must be constructed. This copy should not be written to, because it is not stored back into the B+ tree. This effectively prohibits use of many STL algorithms which writing to the B+ tree&apos;s iterators. I would be grateful for hints on how to resolve this problem without folding the key and data arrays. The B+ tree distribution contains an extensive test suite using cppunit. According to gcov 90.9% of the btree.h implementation is covered. btree.h: changing find_lower() to not use binary search for small node sizes. More about this on my blog. btree.h: implementing bulk_load() to construct a B+ tree from a pre-sorted iterator range. btree.h: replacing copy loops with std::copy calls. btree.h: added template parameter UsedAsSet to skip copying of one byte value_type arrays in set container specializations. license: changing template header source code license to Boost License, and the rest to GPLv3. memprofile: using malloc_count to create a memory profile of map containers. speedtest: many changes to also include tr1::unordered_set and to run both map and set container tests. testsuite: removing cppunit and using enclosed tpunit++ instead. speedtest: added results of new speed test run in 2011 and also appended notes to old speed test doxygen page. btree.h, others.h: implementing erase(iterator) using recursive depth first search for the referenced leaf node. btree.h: Correcting documentation of lower_bound() and upper_bound(). The functions themselves were correct. btree.h: Applying STL allocator patch contributed by MH. btree.h: Correcting limits of for loop to shift pairs from left to right leaf nodes during deletion. speedtest.cc: Modifying speedtest to also test the hash table container implementation from __gnu_cxx. Extending tests by another set of runs measuring only the find/lookup functions. btree.h: Fixing crash when running verify() on an empty btree object. Now the root node is freed when the last item is removed. Also fixing crash when attempting to copy an empty btree or when trying to remove a non-existing item from an empty btree. btree.h: Replacing many / 2 integer divisions with >> 1 as suggested by received e-mails. This may or may not improve speed. I personally doubt it, because modern compilers should optimize these simple instructions. btree.h: Completely reworked reverse_iterator classes. Now they are real implementations and do not use STL magic. Both reverse_iterator and const_reverse_iterator should work as expected now. Added two large test cases for iterators. Also enabling public Default-Constructor on iterators. btree.h: Fixing up a memory access bug which happens in leaf->slotkey[leaf->slotuse - 1] if leaf-slotuse == 0. This doesnt have any other bad effect, because the case only occurs when leaf == root and thus the btree_update_lastkey message is never really processed. However it still is a bad-memory access. btree.h: Fixed a valgrind-detected bug based on a new test case received via email. During the find() function find_lower() is called and returns the slot number with the smallest or equal key. However if the queried key is larger than all keys in a leaf node or in the whole tree, find_lower() returns a slot number past the last valid key slot. Comparison of this invalid slot with the queried key then yields an uninitialized memory error in valgrind.